Kalderetang Tadyang ng Baka. I first came across tadyang ng baka on our first lunch at Kanin Club. Cryspy Tadyang ng Baka is one of Kanin Club’s best sellers. In fact I have tried to replicate their Crispy Tadyang ng Baka and post the recipe long time ago. The branch of Kanin Club at Filinvest, Alabang have now closed shop for some time now. I no longer have any idea if other branches of Kanin Club are still on operation, please do share with us should you know of branches that are still in operation. 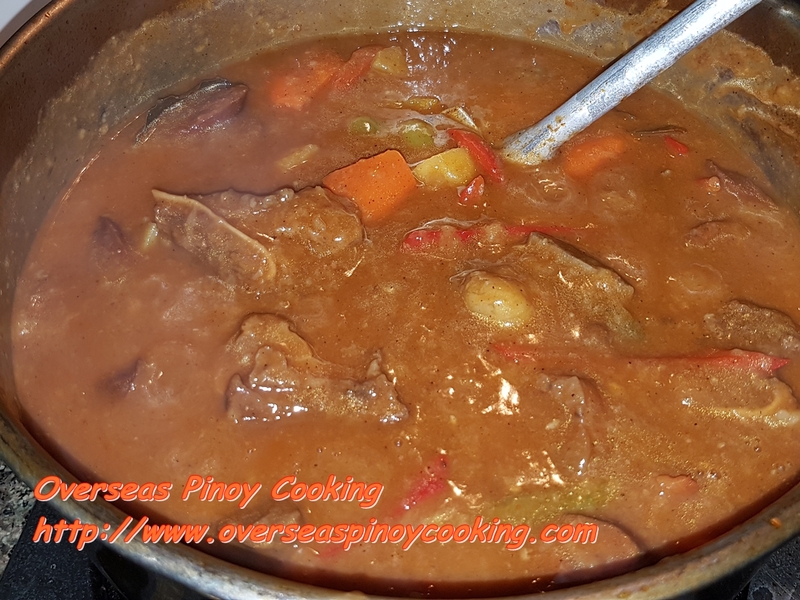 I have been cooking Nilaga out of beef ribs and it always work , the truth you can never go wrong with beef soup dishes. All that is required is really slow cooking, this will extract all the beef flavors from that bone. You may check my Bulalo Recipes by clicking the link. Now we go on to our dish for today Kalderetang Tadyang ng Baka. I had this beef short ribs and I was looking something special to make out of it. What else would be the most especial Pinoy dish than the classic Kaldereta? Before we proceed to our Kalderetang Tadyang ng Baka. 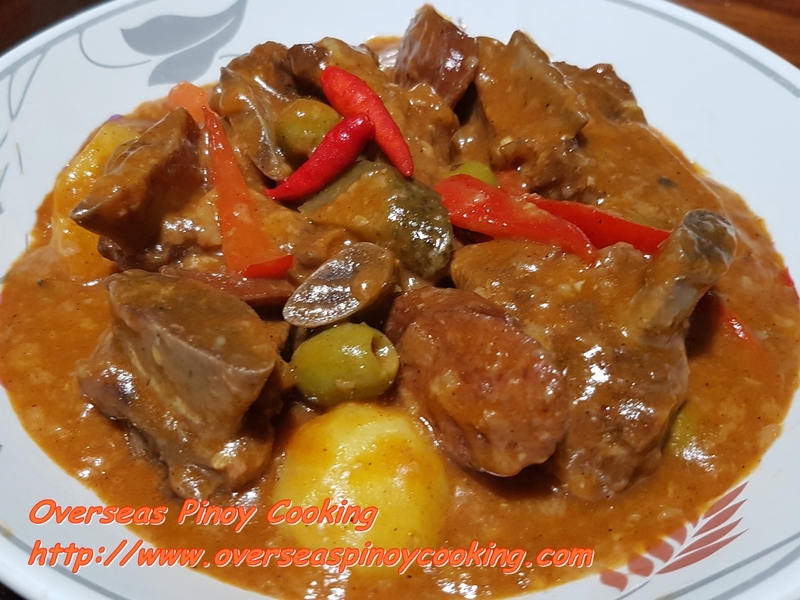 shoul you are also interested on our other kaldereta recipes just click the link list below to check them out. Ok it’s time for our today’s Kalderetang Tadyang ng Baka. 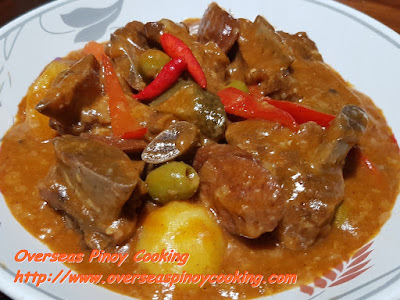 The recipes is similar to my other kaldereta reipes. 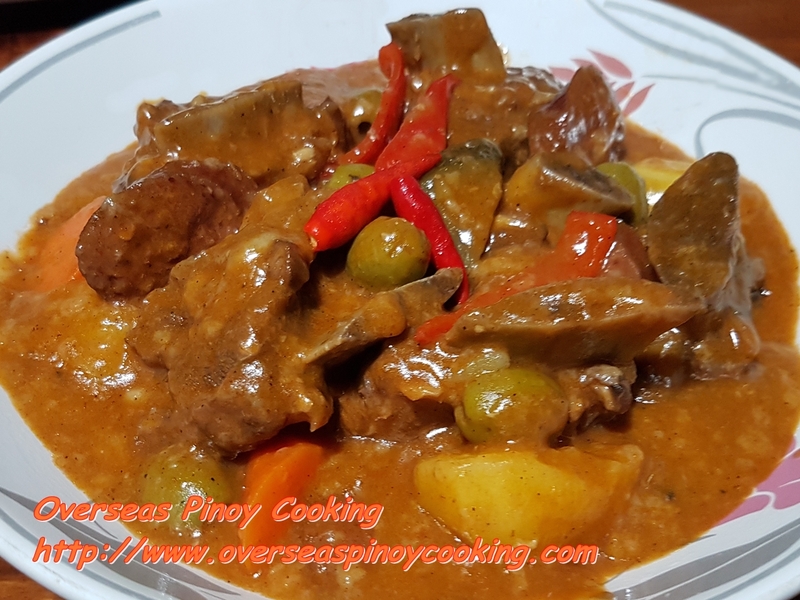 There may be some variations this is because of the availability of ingredients and other cooking parameters at the time our Kalderetang Tadyang ng Baka is being prepared. But for sure our Kaldereta for today is as flavourful and delicious to my other Ladereta Dishes. 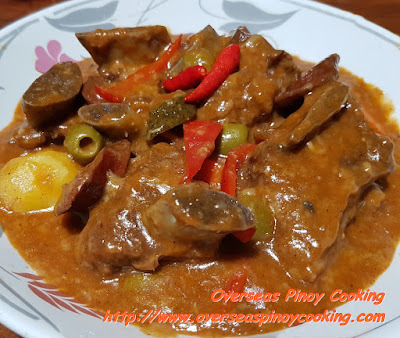 Here is the recipe our Kalderetang Tadyang ng Baka. try it. Place the beef ribs in a big bowl, mixed in vinegar and add 1 tsp. of salt and few dashes pepper, let marinate for at least 5 to 10 minutes. Drain marinade, in a frying pan stir fry beef ribs in batches until all sides are seared, keep aside. In a big sauce pan, sauté garlic and onion until fragrant. Add in the beef ribs and stir cook for another 3 to 5 minutes. Add in the fish sauce, tomato sauce , soy sauce and continue to stir cook for 2 to 3 minutes. Add 3 to 4 cups of water, crushed pepper corns and bay leaf, simmer at low to medium heat for 1 to 1 1/2 hour or until the meat are tender, add more water as necessary. Add in the potato, carrot, chili flakes, dried parsley , mashed bread and simmer for 10 to 15 minutes or until themeet from the beef ribs start to fall off from the bone. Add in the liver paste, green olive, pickled jerkins, pickled relish, red chili and continue to cook for 2 to 3 minutes or until sauce thickens. Add in bell pepper, cheddar cheese and correct saltines if required. Cook for another 2 to 3 minutes and serve hot with a lot of rice.